Babywise Sample Schedules: The Sixth Month. 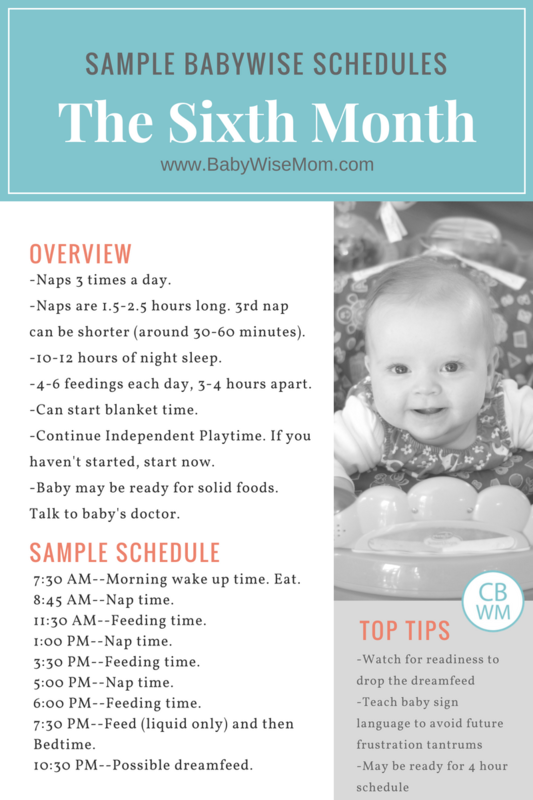 5 month old Babywise sleep schedules. 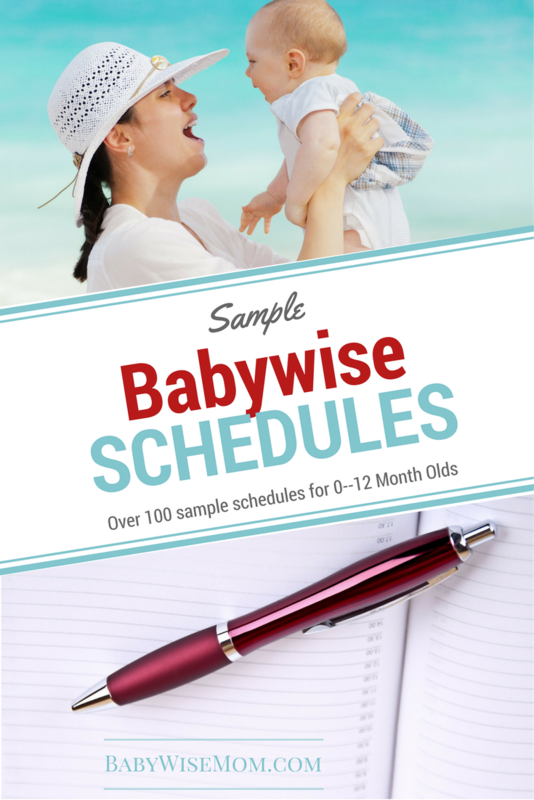 Babywise schedules used by real Babywise babies. 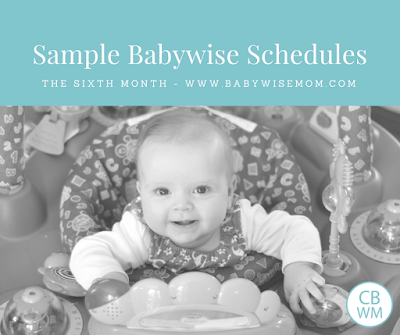 This post gives sample schedule Babywise schedules for the sixth month. 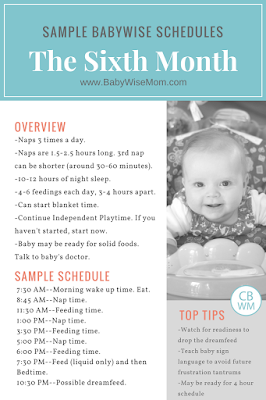 The sixth month of baby’s life comprises weeks 22-26. Baby is five months old. 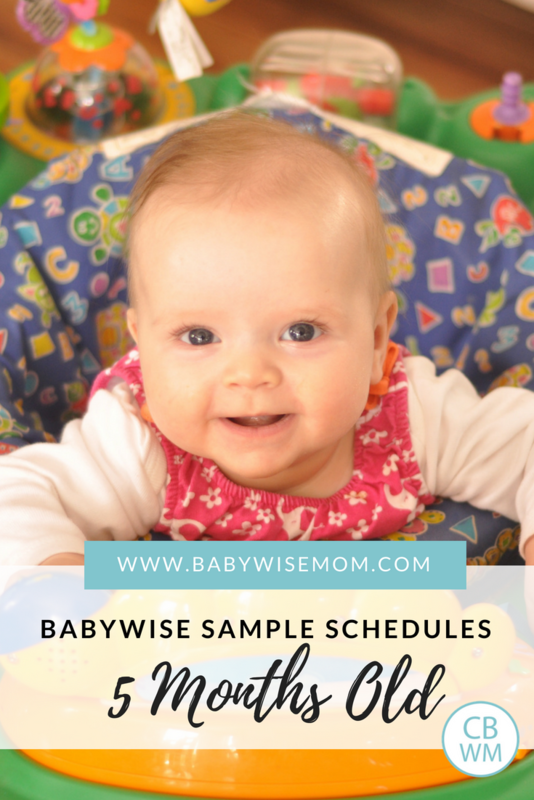 5 month old sample Babywise Schedules. You can start to teach sign language to your baby. This can be done at any point forward. Teething can start to impact sleep. 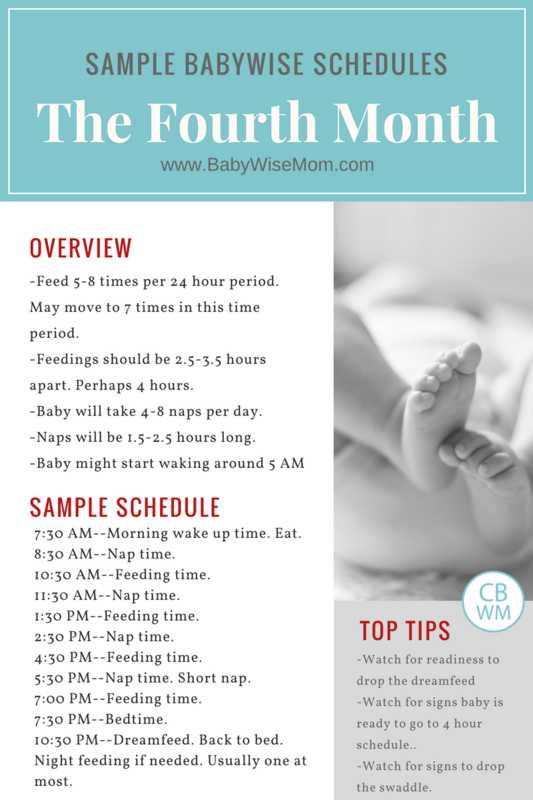 4-6 feedings in a 24 hour period. 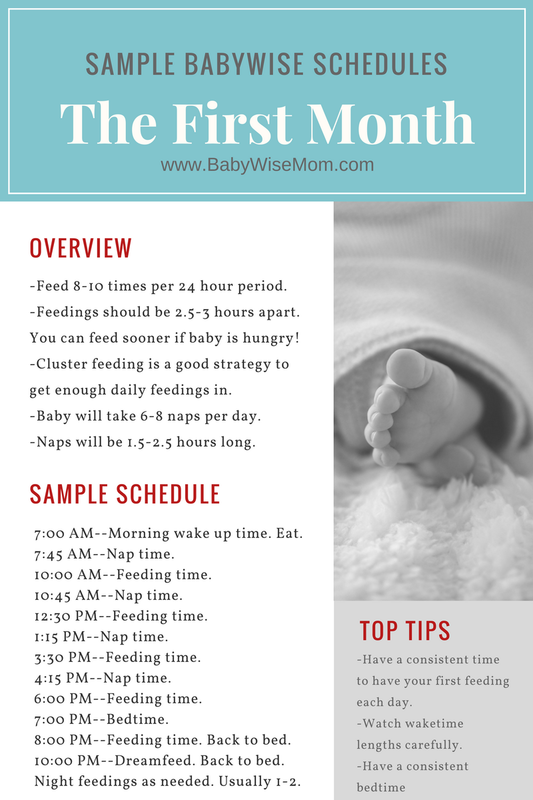 Feedings should be 3-4 hours apart. 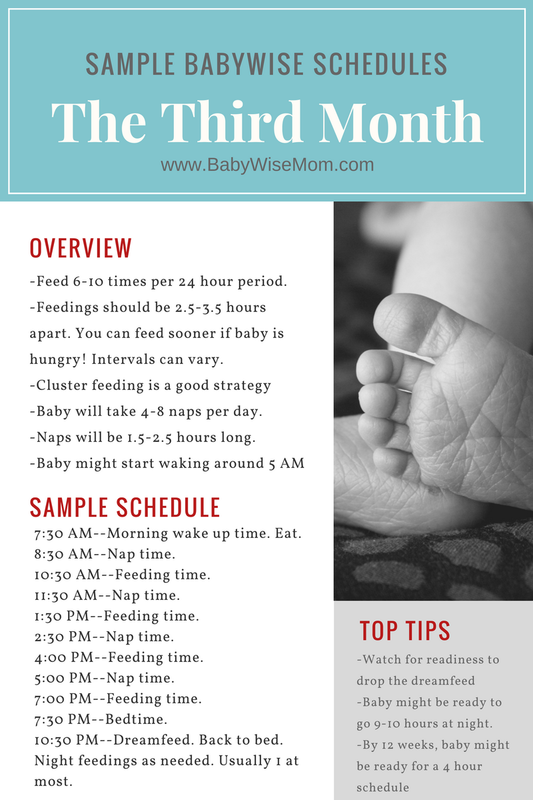 Your baby will take 3 naps a day. Naps will be 1.5-2.5 hours long. The third nap might be a short 30-60 minutes long. 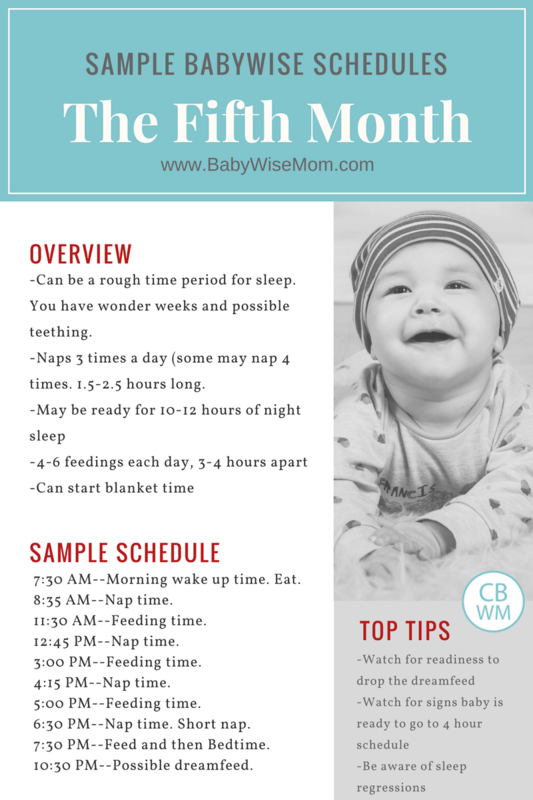 Your baby should get 10-12 hours of sleep at night. You can start blanket time with your baby if you haven’t already. Continue with Independent Playtime. If you haven’t started, work it into your day if possible. Baby might be ready to drop the dreamfeed. Sometimes she eats after only two hours in the evening since she is extending her day out right now. This is a temporary situation and it is fine with me for now. I know it won’t last too long. I find that preferable to having a fourth nap and eating at a 3 hour interval, and thus having a later bedtime. I want bedtime consistent. You can see that the end of the day is crammed in there. I would like to be able to drop the dreamfeed so we can extend the schedule so it isn’t so smashed together at the end of the day. The other night, I said our 7:30 PM nursing is basically just a formality. 5:30–feed with solids–half a banana mixed with 2 T oatmeal and sweet potatoes (1-2 T) OR butternut squash (1-2 T)–we alternate every other day with squash and sweet potatoes. 8:00 AM–wake her up, nurse, eat 2 T oatmeal and 2 T prunes. She now usually does eat all of her oatmeal. Some days, she loves her prunes. Others, she hates it. She is really ready to both drop the dreamfeed and extend to a four hour schedule. I am really reluctant to drop the dreamfeed before we move. I would not be hesitant to move to a four hour schedule before we move. I always say I prefer dropping the dreamfeed before extending the schedule, but I might just have to extend the schedule first under these circumstances. I need to do something fast. Things are getting too tight in the evening and I have to wake her up for every meal of the day. 8:00 AM: I wake her. Nurse. 2 T fruit (prunes or peaches) and 3 T oatmeal. This is followed by bath and then independent playtime. 12:00 PM: I wake her (yes, she takes a 3 hour nap). Nurse. 2-4 T peas and 2-4 T of bananas. This is followed by some time with siblings and some tummy time/floor play. 1:15-1:30 PM: Nap. Almost every day this week, she took this nap at my parent’s house. 4:00 PM: I wake her. Nurse. 4 T yellow veggie, 2 T fruit (usually peaches), and 4 T oatmeal. This is followed by us going to our new house to work on it. I would put her in the front carrier or in the bouncer. Some days, she and I would drive to pick up food for the workers. 6:00 PM: Nap. This was taken in my new neighbors master bedroom closet in her bassinet. 8:00 PM: I wake her. Some nights she woke on her own. She sleeps so well! I never expected her to sleep well there. They have six kids, so you know things just get really loud sometimes. The girl can sleep. Nurse and then back to bed at home. 10:20 or 10:30 PM: Dreamfeed. I would ideally like the last feeding to start at 7:30 so she can be in bed by 8:00, but for right now, it is good for me to have that extra 30 minutes to work on the house. We are still figuring out our perfect 4 hour schedule. 8:00 AM–wake, nurse, eat 2-3 T prunes and 1 T peaches mixed with 3 T oatmeal (3 T dry before mixed with water). 12:00 PM–wake, nurse, eat about 4 T green veggie and 4-8 T banana (she will eat an entire banana. She loves them). 4:00 PM–wake, nurse, eat about 4 T yellow veggie and 4 T pears. I then offer 2 T oatmeal and let her eat until full. She usually doesn’t eat much oatmeal, but I offer it to see if she is still hungry. She sleeps through the night, but her naps are very spotty. Her “normal” nap is 45 minutes long, but she usually has one longer nap (1.5 – 2 hours) each day, but not always at the same time. If she wakes up before it’s time to eat, she plays for a bit. Dreamfeeds between 9:30-10:15, depending on the night. I find that her nap routine is the least consistent since I work part-time and different family members keep her on those days. Her bedtime, morning waketime, and feeding time is very consistent. I would like for her naptimes and activity times to be more consistent. 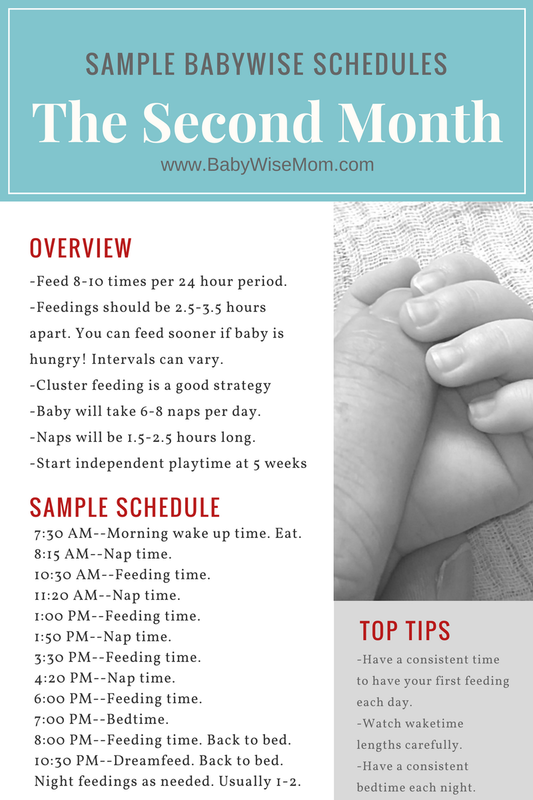 After charting everything for several days as suggested by the Baby Whisperer, her naptimes really depend on who keeps her that day. Since 4 months (he will be 6 months this week) we have been working on transitioning to 3.5-hour schedule. After a few days of the longer schedule, he wakes up early from naps and we end up doing the 3-hour schedule above, so for the last little while we’ve just done the longer schedule 2-3 days a week which allows me to decide which days rather than him. Hopefully we’ll do this all the time soon!